Add some fun decor to your desk with this tropical bromeliad plant. 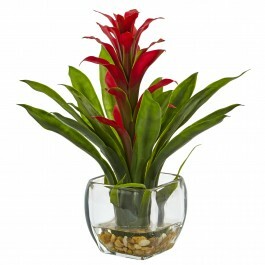 Lush green leaves grow vertically around the floral focal point. Comes in square glass vases with neutral pebbles and faux water. At one foot tall, this arrangement is perfect for a small space. H: 3.75 In. W: 4 In. D: 4 In.